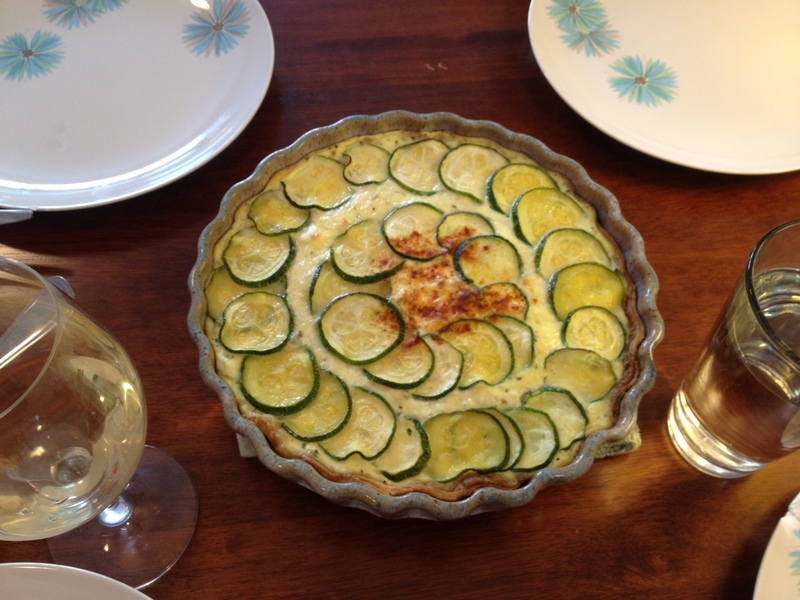 Vegetarian Week: Zucchini Quiche | Food E.
When it came to choosing the focal point of the meal I knew I did not want to serve pasta. If you are a vegetarian or know any vegetarians, you know that 75% of vegetarian entrees involve pasta in one way shape or form. Ignoring the fact that a steady diet of pasta is diabetes waiting to happen, how boring is that? Pasta with vegetables 24/7. Womp womp. This dish is not ground breaking or even particularly new but it had even the meat eaters at the table going in for seconds. It’s hearty, it’s filling, it is by no means healthy, but it fits the bill of main dish quite nicely in this vegetarian meal. Bake pie crust as directed. If you’re using homemade pie crust, roll out the dough in your pie or tart pan, prick the bottom with a fork, and bake until lightly brown. Let cool. In a large skillet, sautee zucchini in butter until slices are softened. Drain the zucchini of all moisture (NOTE: this is important, as zucchini has a surprising amount of water in it and if you don’t cook it down and drain it, your quiche will be a soggy mess). Fill your cooled pie crust with half the zucchini. Top with mozzarella cheese. In a small bowl, lightly beat the eggs together. Add salt, oregano, basil, garlic powder, and pepper and whisk until completely combined. Add ricotta cheese and half and half, and whisk until combined. Pour egg mixture into the pie tin and spread so it’s evenly distributed. Top with remaining zucchini slices in an aesthetically pleasing pattern. Top with a sprinkle of paprika. Bake the quiche for 45 minutes or until firm. Let cool for 10 minutes before slicing.